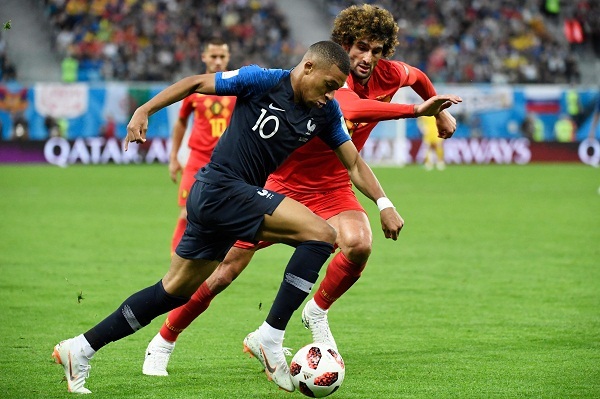 Title aspirants France lived up to the expectation as they beat spirited Belgium by 1-0 goal to moved into the final of the FIFA World Cup held in the early hour of Wednesday at Krestovsky Stadium in Russia. The match began at a fast pace with both France and Belgium were playing equally good, matching move after move. However after a barren first half, France took the cherished lead in the 51stminutes. French defender Samuel Umtiti who plays for Barcelona, scored a brilliant goal for France when he nodded Griezmann’s corner past GK Courtois (1-0). It wasn’t a free-flowing match but it was a disciplined display from France and they largely kept Hazard and De Bruyne quiet. Varane and Mbappe in particular were superb. A third World Cup final for France and they wait for the winner of the second semifinal in the final scheduled to be played on July 15. The second semifinal is scheduled to be played tomorrow (July 11) in Luzhniki Stadium in Moscow.